Sir Richard Branson's Virgin Atlantic has been holding takeover talks with its rival BMI British Midland, in a move which could produce a powerful competitor to British Airways. BMI has 17% of the landing slots at London's Heathrow Airport, but limited access to the lucrative transatlantic route, whereas Virgin has the transatlantic rights but only 3% of Heathrow's slots. But despite the possible benefits, which the BBC's correspondent says could result in a deal being signed by late this year, both are playing down the talks. "There have been no definitive conclusions reached on the potential opportunities, nor any other form of more permanent tie-up between the two companies, such as the acquisition of BMI by Virgin," a statement from the airline said. BMI is controlled by its founder and chairman Sir Michael Bishop. Lufthansa and the Scandinavian airline SAS hold 49% of the business. Virgin is thought to be eager to take over BMI's European routes into Heathrow because these could feed into its long-haul flights to the US, the Caribbean, the Far East, India and Africa. "BMI and Virgin have for some time been exploring possible areas for greater co-operation in expanding their respective businesses, including code sharing expansion, potential sharing of facilities and joint lobbying on matters of common interest," Virgin said. A BMI spokesman said the airlines were not currently talking about a tie-up. "Although the two companies talk regularly about a range of issues and have explored and continue to explore various forms of co-operation there are no ongoing discussions in relation to a merger." 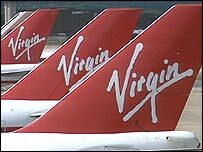 Sir Richard Branson's Virgin Group owns 51% of Virgin Atlantic and the remaining stake is owned by Singapore Airlines.